The Playmobil Covered Wagon with Raders includes a secret hiding place for the treasure and the covered roof can be removed. The set includes 2 Playmobil bandits and 2 Playmobil drivers, complete with 3 horses and all their weapons. One supplied; Size H20, W35, D10cm; For ages 4 years and over; EAN: 4008789052483. WARNING(S): Not suitable for children under 3 years old. Only for domestic use; To be used under the direct supervision of an adult. This toy does not provide protection. 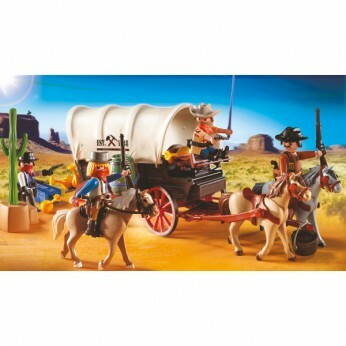 This toy costs approximately £24.99 (for the latest and best prices make sure you check our retailer list for the Playmobil Covered Wagon 5248 above). In our review of Playmobil Covered Wagon 5248 we classed it as being suitable for ages 3 years, 4 years, 5 years but recommend you check the manufacturer specific advice before purchasing.